Jimi Tenor - Quantum Connection. Vinyl LP. Bleep. Finnish underground legend Jimi Tenor turns in another singular single here. 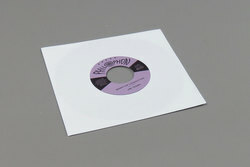 Taking his cues from the recent incursion of Hi-life sounds into discos worldwide - see, for instance, Jun Kamoda’s work for Black Acre - Tenor works his magic on A-side ‘Quantum Connection’. The track’s combination of a Hi-Life rhythm section, raucous sax chorus and psych-funk bass lick make this one a serious fire starter. On the flip, ‘My Mind Will Travel (Teen Party Edit)’ takes further cues from the worlds of Hi-Life, Afrobeat and Lagos Funk, this time bringing together a propulsive groove with some lovely harmonies that wouldn’t sound out of place on a Femi Kuti LP.